Do Pay-Per-Sale affiliate programmes pay? Do “Pay-per-Sale” Affiliate Programmes Pay? One way a blog can theoretically make money is by registering with affiliate programmes. Pay-per-sale is an online advertisement system where the publisher or Web site owner is paid according to the number of sales directly generated by an advert. (For more, see Wikipedia). Small bloggers usually only have access to Pay-per-sale programmes and others such as Pay-by-click or Pay-by-view are not even offered, with the exception of Google Adsense. Pay-by-click or Pay-by-view deals tend only to be offered to sites/blogs reaching 10,000 views per month and even then this number may be considered too small or not worth the effort, depending on the subject matter. Pay-per-sale looks rather lucrative at first sight. For example, bookmakers offer a 25-35% share of their net revenue from any referrals. Other companies market their affiliate programmes by offering fixed rates which can vary between 25€ and 120€ per lead or sale. There are others, like Amazon, who only give 5% but assure you of a high conversion rate, in other words, that many of your readers will go on to transact a purchase via their site. All of this sounds hugely promising and as adverts appear wherever you look on the Net, it is easy to imagine that it must be worthwhile doing. Armed with this sudden motivation for easy money, bloggers then start registering with various affiliate programmes and after working out the complicated php coding for proper display and positioning of adverts, it is time to sit back and watch the money rolling in. Or not. The first week passes: zero income. Your first thought is that there must be something wrong. The blog is checked, the programming adjusted. One month passes: still nothing. Perhaps the problem is the blog’s small readership and that things will be brighter with time when more visitors arrive? A few more articles are written to drive traffic. 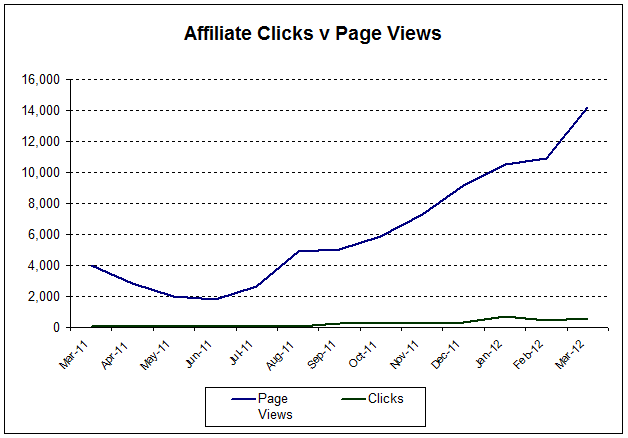 Half a year passes, the visitor numbers have trebled, but the affiliate income is still zip. 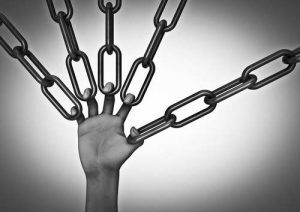 Pay-per-sale affiliate programs are empty promises and cash is only ever seen by the exploitative advertising companies! Pay-per-sale affiliate programmes are extremely useful to the commercial companies who offer them as there are literally millions of bloggers who willingly display their adverts nice and free of charge hoping to receive some ‘commission’ income in return. Of course, the adverts are placed very purposefully as the blogger knows his audience and believes that well-targeted adverts will finally realise some income. Reaching such a precise target audience is otherwise difficult to achieve for advertisers anywhere else. The affiliate departments of the commercial companies have the task of keeping the bloggers ‘sweet’. From time to time there are prize draws, or other encouraging incentives such as affiliate conferences with free food and entertainment laid on. In addition, there are numerous motivational emails received offering even juicier commissions, which to the blogger all look great on paper but never reap rewards. At some stage, after months of trying and waiting, the penny drops and the blogger realises that huge numbers of clicks (referrals) are needed to generate any sales. Furthermore, he/she actually has no reliable way of checking if clients referred to the advertisers’ products actually go on to buy, and there is also no way of verifying whether the displayed commission amounts are in fact correct. It may also be likely that the referred customer already had a cookie on his/her computer and therefore another blog or Web site received the benefit of the sales, or more cynically, that the affiliate software of the commercial companies simply was never intended to register purchases to the affiliate’s account. Since March 2011, Soccerwidow received 40,559 unique visitors with 81,193 page views. On each single page there were at least three affiliate links displayed meaning that visitors were exposed to around 240,000 banners or other advertisements. In these 13 months there were 3,245 clicks to affiliate programmes (click-through-rate: 4% of page views), which resulted in 55 sign-ups (1.7% of the clicks). Furthermore, not all of these 55 people who used a Soccerwidow referral and registered themselves with a company actually transacted a purchase. Even worse, there is one bookmaker with a Soccerwidow referred client on his books who keeps winning his/her bets! (perhaps he/she follows Soccerwidow’s predictions? 😉 ). This means a negative commission with this particular bookmaker and until this reverses back into profit, Soccerwidow will not receive a penny. Fortunately, the terms and conditions of this agreement do not mean that Soccerwidow has to contribute to the losses of the bookmaker! In summary: Affiliate programmes are not worthwhile at all to any blogger, whether there is a 35%-50% commission offer granted or an agreed fixed amount per sale! Perhaps Soccerwidow.com did not receive enough visitors? This was surely the case in the first few months, but in the meantime we have grown from just a dozen visitors per day to over 250, with an Alexa rank now healthily below 250,000. 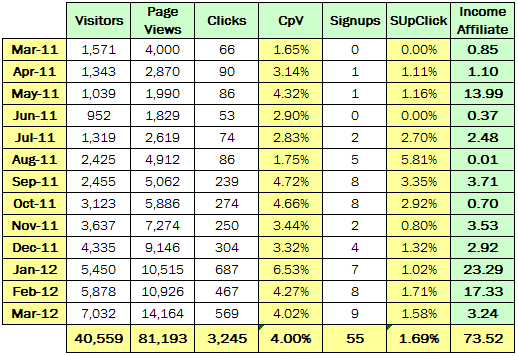 In March 2012 alone, the site absorbed over 14,000 page views. If numbers are estimated for the future assuming similar continuous growth, Soccerwidow will reach 75,000 page views per month in around one year’s time (March 2013), or approximately 1,300 daily visitors. This number will produce around 3,000 clicks to affiliate programmes of which, on current experience, about 50 will sign-up with our partners. Of course, there is always the outside chance that in this relatively small pool of clients there will be a big fish creating copious ‘commission’ income. In the meantime, affiliate links and banners will be displayed approximately 1.4 million times on the blog (for free, of course!) treating readers to the usual ‘eye candy’ of flashing pictures and multi-colours, without receiving any remuneration in return. Nevertheless, pay-per-sale affiliate programmes are probably a good beginning in the world of internet marketing. By signing-up, the blogger gets access to professionally maintained Web sites and can learn which formats exist, which adverts perform best and how to build an advert inventory in the blog. But from our perspective, there is definitely not much more scope than this! You should not expect or budget for much income from pay-per-sale affiliate programmes unless you run a huge and popular blog with thousand of visitors a day but by then you’ve probably found other ways of making money from the traffic. I am already use pps program since 2 years ago, and its work very well..
Great article! I am curious what you have found works best on your blog to monitize your efforts? Thanks for this article. Interesting and makes a lot of sense.